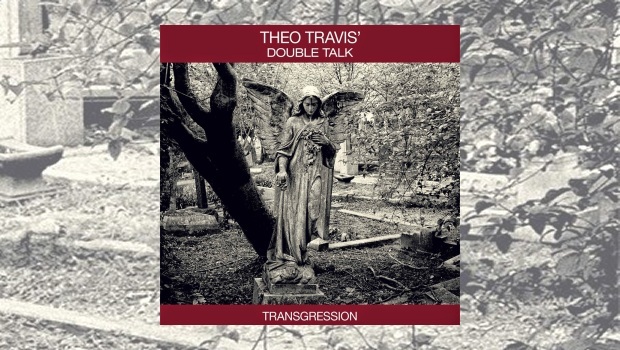 Transgression is a truly stunning album, displaying the many faceted sides of composer and multi-instrumentalist Theo Travis. An album that effortlessly brings together the best elements from the rock, blues, Canterbury, jazz and progressive jazz fields, resulting in an absorbing album of depth and beauty. Once again Theo Travis demonstrates his innate musicality as he and the band step between differing genres, coalescing them into thoroughly absorbing melange. Theo Travis’ rise through the musical ranks could hardly be considered as meteoric, more a gradual rise, but one that has seen him gain huge respect. His collaborative works have seen him recording and/or performing with Robert Fripp, Steven Wilson, Jade Warrior, Gong, Soft Machine Legacy and more recently as part of David Gilmour’s touring band. Along with these collaborations he has also produced a fine body of solo albums starting back in 1993. I first stumbled across his work in 2004 with the difficult to pigeon-hole, but ultimately absorbing, Earth To Ether. For Transgression, Theo has brought back the winning formula from his 2007 Double Talk album with guitarist Mike Outram and Hammond organist Pete Whittaker. The only line-up change comes with Nic France taking over from Roy Dodds on drums and percussion. A formidable quartet, who, right from the first track, pull you into their world. Although a studio album in every sense of the word, the music has a distinctly live, organic feel and you are left in little doubt that these were very much first, or second take recording scenario, and although Steven Wilson has waived his studio craftsmanship over the proceedings the music still retains that fresh, vibrant and spontaneous feel. As with Double Talk, Theo once again looks to bring in influences from the late 60s and early 70s, moulding them into a contemporary format. The joyful Smokin’ At Klooks is a prime example, sharing its DNA with Peter Green’s Black Magic Woman, with Mike Outram superbly capturing the mood with his distinctly reverbed guitar tone and sweet harmonies. 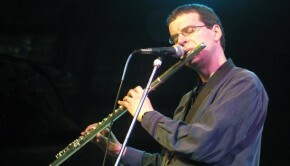 Theo Travis adds some magically floating flute to this truly wonderful track. Talking of wonderful tracks we should move to another tranquil moment from the album and the sympathetic adaptation of the Wyatt/Catherine song Maryan taken from Shleep (97). Pete Whittaker’s Hammond takes over Phillip Catherine’s wonderful guitar arpeggios with the flute taking on the track’s themes and melody. In contrast the album’s title track bookends in early Floyd (Echoes) mode, before running through a whole potpourri of intricate and wonderfully ornate themes and solo passages. Brilliant! Prog fans will delight in the abridged version of The Tangent’s A Place In The Queue. Co-written by Theo Travis and Andy Tillison, the track wends its stately way through classic 70s prog with more than a nod to the mighty King Crimson. 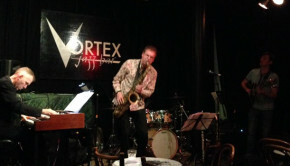 Each of the musicians are allowed the opportunity to shine, with Mike Outram’s atmospheric guitar taking first honours and although Theo Travis threatens to cuts loose, he respectfully hangs fire, allowing Pete Whittaker a sublime moment of atmospheric Hammond magic, before returning with the sax. All serves as a prelude to mid-section break – a distinctly “hairs on the back of the neck moment”. We return finally to the more majestic opening theme. I can see Transgression having a broad appeal amongst the Canterbury, fusion and jazz rock quarters and delving into the more ambitious side of prog. An instrumental album that is full of ebb and flow, with all the musicians bringing much to the table and as can be witnessed in two tracks that occupy the middle of the album. Song For Samuel is a bright and breezy jazz number that had me thinking I should maybe dig out some of my Barbara Thompson’s Paraphernalia albums out. In contrast the delightful restrained Everything I Feared sees Mike Outram play some delicious guitar that’s not a million miles away from Jeff Beck. Theo adds some tasty flute, Nic France holds the track wonderfully in check and Pete Whittaker adds the bass (pedal) parts and lush chords. Life and its trials and tribulations seems to have this uncanny knack of throwing a spanner in the works, which is my way of saying why the review of this album has taken much longer to appear than I had wished. The upside is that I’ve had a longer time period to sit and absorb the music and although Transgression resonated from the very outset, two months down the line it’s turned out to be a stunning album. It’s beauty lies in the richness of the melodic structure and depth of musicianship – an album that can be enjoyed on a purely listening level, but with added bonus of having substance and depth enough to warrant more detailed listening.